Your child doesn’t have to play in the Super Bowl for you to know the feeling. Their team was supposed to win and then they didn’t. What do you do? Being the mother of two girls who played soccer and ran track, I thought I knew the answer: Talk it through. Tell them you love them. Say it’s just a game. Remind them there’s always a next time. Isn’t that what good parenting is all about? Keeping channels of communication open even in tough moments? Turns out the answer is no. I learned this when I had a “don’t speak” moment. My “don’t speak” moment came in a more mundane setting. I was standing on a grassy hill at a high school soccer game, and the command was delivered by a parent named Peter, whose daughter is a year older than mine. This made him an ideal adviser; he had already been where I was now, and he hadn’t yet had time to forget. We had come to cheer on our girls in a high-stakes varsity soccer game. The winner would go on to represent the county in the state tournament. For the seniors, it was the last chance to grab an elusive championship for the school. Adding pressure, the opposing team was a rival from a nearby town. My daughter, a junior, was new to the team, but her drive to win was strong. No one was cocky, but they had the confidence that comes with a winning season. You could feel the communal belief that this would be the year they went all the way. They just needed this last win. Their lead slipped to a tie toward the end of the second half. In the last minute of play there was a stumble, scrambling and a goal for the other team. Parents supplied transportation for home games, so we waited while our daughters gave sullen high-fives to the winners and then huddled with their coach, listening as he shared his disappointment. When he was done they separated and, backpacks slung over shoulders, trudged across the field toward where we stood. Watching their grim faces approach I wished a meteorologist were present to confirm my suspicion that 22 high school girls who’ve just lost a chance at a state title can change the atmosphere, collectively sucking the light out of the sky. Their fury was frightening. Because he had been through this before, I listened and walked to my car alone. I felt her before I saw her, walking silently beside me. Reassuring phrases immediately formed in my brain but, channeling Peter, I said nothing. A moment later I noticed her teammates walking with their parents, mothers mostly, who offered words of consolation. “Are you okay?” and “You played well,” and “There’s always next time.” To me the words sounded gentle and kind. She got out of the car and asked, “What’s for dinner?” and I told her. When she went upstairs to shower, I phoned Peter to thank him. “Any other magical advice?” I asked. On the continuum of empathetic to indifferent, I’m right there with the empaths from “Minority Report.” I’m not boasting; sometimes feeling other people’s pain isn’t helpful. Still, if you’ve suffered a setback, I’m usually a pretty good choice of companion. If I see someone is hurting, I’m not shy about acknowledging their pain. What a revelation to discover that’s nothing compared to standing as silent witness. But what about that pesky keeping-channels-of-communication-open thing? How does staying silent jive with that? The answer came to me later when I realized I’d misunderstood Peter’s point. The goal of silence wasn’t to prevent conversation. It was to give my daughter space to initiate it. “Don’t speak” really meant “listen first.” And the day of her soccer game, it worked like magic. In the years since my “don’t speak” moment, I’ve had many chances to practice what I learned. Moments with big questions such as: Which college should I go to? Which job would be better? Which wedding dress should I pick? Moments that would have ended poorly if I hadn’t learned that lesson: To wait and find out my daughter’s opinion before I chimed in with mine. Nancy Star is a former movie executive and author of Sisters One, Two, Three. In addition to The Washington Post, her essays have appeared in the New York Times, Publishers Weekly and Family Circle. Visit her at nancystarauthor.com and follow her on Twitter @NancyStarAuthor. What side of the net do sports medicine experts land on when discussing volleyball ankle braces? There little doubt that ankle sprains are the most common acute injury in indoor volleyball. The debate begins when recommending for or against the use of volleyball ankle braces. I’m going to review this subject by first listing some studies about volleyball ankle braces. More importantly, I will tap the awesome collective wisdom of my USA Volleyball Sports Medicine colleagues Aaron Brock, ATC and Jill Wosmek, ATC. Aaron works with Men’s National Teams and Jill was with the Women’s National Team for two Olympic cycles. I am not going to review ankle taping, since many athletes do not have access to proper ankle tape applications by athletic trainers. Also, even when taping is done well, most protective effect is lost after 30 minutes of application. The majority of ankle sprains are when the ankle inverts (rolls in). This most often occurs with play at the net where athletes make contact with another players foot when landing from a jump. The theory behind volleyball ankle braces is to reduce abnormal ankle motion. Some fear that depending on volleyball ankle braces might weaken lower leg muscles and increase knee injury risk. I do not endorse or have any investment in particular types of volleyball ankle braces. I will only list particular brands and makers if they were mentioned in studies. All expressed opinions are our own. They do not represent official policy of USA Volleyball or any other group or employer. What does the medical literature say about volleyball ankle braces? A prospective study of high school players concluded that two types of volleyball ankle braces (Active Ankle Trainer II and Aircast Sports Strirrup) protected players who never had ankle sprains. They however did not prevent subsequent sprains in players with a past history of sprain. Moving up to the collegiate ranks, prophylactic use of double-upright padded volleyball ankle braces significantly reduced the injury rate. Limited evidence suggests that ankle braces do not increase the risk of knee injuries. Addressing strength of leg and hip muscles along with limited ankle dorsiflexion may be a sensible prevention strategy. What do my expert volleyball medicine colleagues have to add about volleyball ankle braces? The great majority of ankle sprains seen with the US Men’s National Team have been to the unprotected ankle. It is still possible to sprain an ankle while wearing ankle braces but the risk is significantly diminished. Also, ankle sprains while wearing braces usually result in a less severe sprain. Type of shoe is also important. Find a proper heel position that isn’t “too high” as lower heels reduce side to side ankle motion. But within a week, White fell in love with the game in which the block party never ends. Volleyball fired up her competitive juices just as much as basketball, if not more. "Only there was a net in between," she said. "You can put in all this aggression toward one object and let it out." Basketball's loss became volleyball's gain. White was the Big 12 Freshman of the Year at Texas, which reached the NCAA title game in December. Her decision to pick volleyball over basketball follows a national trend. Two years ago, for the first time, more high school girls played volleyball (432,176) than basketball (429,504), according to the National Federation of State High School Associations. In 2015-16, volleyball added another 4,133 girls to those numbers, while basketball lost 276 participants. Examine the past decade, and the numbers are more striking. Statistics compiled by the NFHS show an increase of more than 40,000 volleyball players in that span and a decrease of 23,000 basketball players. "There's been a huge African-American crossover into our sport, and it's become the social norm now to play volleyball, whereas 10 or 15 years ago, it was basketball," Texas coach Jerritt Elliott said. "It appeals not just to the super tall but the super small. The super small has a niche with the libero and the [defensive specialist] position where they can find success at a very high level." Volleyball, which had its national semifinals showcased on ESPN in December, has evolved way past the days of a picnic pastime. "There's a whole lot of girls out there who like to be powerful, who like to be strong and assertive and aggressive, but they also like having a net between them," said Kathy DeBoer, executive director of the American Volleyball Coaches Association. "They don't enjoy checking each other or boxing each other out or slide tackles." Mike Flynn, editor of the national recruiting newsletter Blue Star Report and a longtime authority on girls' basketball, points to all the choices girls have today and the challenges specific to basketball. "You go where you see success and where you have access to success," he said. "Basketball is a hard sport to master. Unless you're willing to put in the time and effort and have a certain level of athleticism and hand-eye skills, you will not be successful. You will be pushed out of the sport because of what it demands. 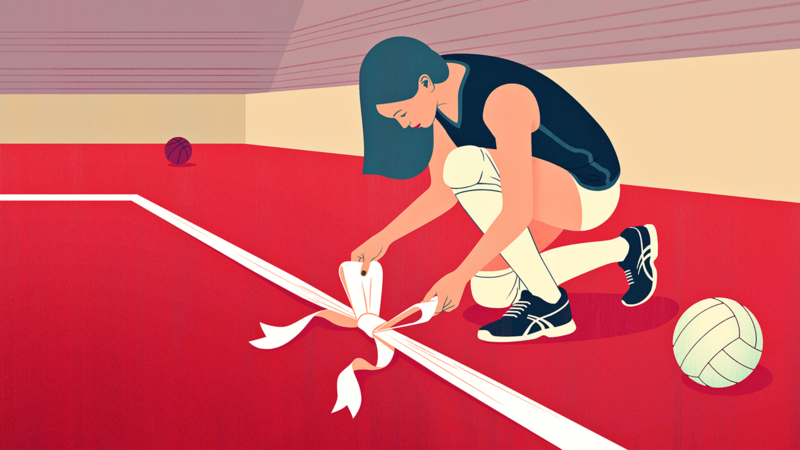 In volleyball and lacrosse, those barriers are lower." Jasmyn Martin arrived at Minnesota a semester early to spring into her volleyball career. Jasmyn Martin set aside basketball recruiting letters from Tennessee in favor of a stack of mail from volleyball coaches. Martin, who graduated from Hopkins High in Minnetonka, Minnesota, a semester early to train with the Gophers this spring, prefers the energy of volleyball to hoops. "The relationships you build, how together you are, set it apart from basketball," she said. "You come together after every point." Hayley McCorkle, who finished her career on North Carolina's volleyball team last fall, was born two hours away from basketball-crazed Tobacco Road. Once rated a three-star recruit by espnW HoopGurlz, she chose volleyball over hoops. "I wanted to compete against someone, but I didn't want that physical contact," she said. "Volleyball allows you to be a little more of a girl. You get to wear the ribbons, wear pink, wear your hair however you want and still be dainty when you play the sport. That draws a lot of young athletes to the sport." Washington's Kara Bajema was one of many volleyball players who echoed that sentiment. The 6-foot-2 freshman middle blocker twice earned state MVP honors after leading Lynden Christian High, about two hours north of the Huskies' campus, to a pair of championships in basketball. But she gravitated toward her other love, volleyball, and committed to Washington at the end of her sophomore year. "Honestly, I just like the volleyball environment better. It's a little more chill," she said. "Basketball is definitely more hard-core, and I like being a girly girl sometimes." But Bajema encourages girls not to decide on one sport too early. "Play as many sports as you can in high school, and have fun with them," she said. "Some people feel the pressure to choose so early. I would encourage people to play as many sports as they can in high school." Although it's rare, not everyone makes a choice, even in college. There's a whole lot of girls out there who like to be powerful, who like to be strong and assertive and aggressive, but they also like having a net between them. That's the case with Abby Cole, who played volleyball for four years at Michigan and joined the basketball team for the first time this winter. Cole said both sports offer a unique set of challenges but complement each other. "I would never say basketball's more of a masculine sport than volleyball. You're not playing men's basketball; you're playing women's basketball," she said. "The bows and the hair and the way the uniforms fit don't affect the way the sport is played. Playing volleyball, you're not told to play like a lady. You're told to play tough and play hard and be aggressive. Whether it's basketball or volleyball, you hear the same things from coaches." Likewise, Kathryn Plummer, a key freshman in Stanford's run to the 2016 NCAA volleyball championship, was drawn to its versatility. "For some girls, the bows and uniforms matter when they're younger, but at the higher levels, you don't necessarily want to wear spandex," she said. "You might wear sweats when you're practicing. At the higher level, athletes are athletes. It's all about the sport." At 6-foot-6, Plummer would be a godsend to Tara VanDerveer, whose Cardinal basketball team lacks significant size. Plummer played basketball as a youngster but decided against pursuing it in high school. "I love basketball -- to watch," she said. "I love to play volleyball. In basketball, I could post up and score. In volleyball, you have to be good at everything. You have to work together more. [In basketball, you can own the court. It can be your show. For volleyball, you need everybody." Bryon Larson, whose Dynasty Volleyball Club in Kansas City, Kansas, is one of the most elite in the nation, points out that the skill sets for the two sports are similar. "We're competing for the same athlete: lean, long, fast-twitch kids," he said. "That's the dream prototype player." Kathryn Plummer stands 6-foot-6 and could post up and score with the best of them on a basketball court. A decade ago, volleyball youth programs were scarce. Larson started his club in 2009 as a feeder system for the high school team he was coaching. Eight years later, the club fields 25 teams. "We can't field enough teams," he said. "I could add six or seven more, but for me, it's a matter of trying to be Macy's -- not Walmart." When Troy Tanner started Tstreet Volleyball Club a decade ago in Irvine, California, it was largely due to his daughter Bailey's interest in the sport. Now he has expanded to a second location in Laguna Beach. He runs programs for tots, tweens and teens, and the words "Tstreet Club" are found on many NCAA volleyball bios. That includes the University of Washington's roster, on which Bailey plays alongside Tstreet alums Crissy Jones and Tia Scambray. Tanner attributes much of the sport's success to the simple fact that volleyball is fun, and college opportunities are plentiful. The NCAA recognizes 334 volleyball teams; beach volleyball, fully sanctioned in 2015-16, is the NCAA's fastest-growing sport. Added exposure has come with the Big Ten, SEC and Pac-12 networks. "I have a little cousin who watched the tournament," McCorkle said. "She didn't know anything about volleyball until she saw it on TV. Having it out there for more young girls to watch allows them to be more drawn into the game." High-performance training can be expensive -- elite volleyball players can spend upward of $7,000 annually. But that's an amount plenty of parents with means fork over to see their daughters achieve. As healthy as volleyball numbers are, DeBoer offers a cautious optimism. "I don't want girls' or women's basketball to fail because that would be horrible for women's sports," she said. "Us becoming the top team sport was a combination of growth in volleyball and contraction in girls' basketball. When the sport that is your bell cow -- and basketball is our football -- when participation decreases, that is cause for concern." In volleyball hotbeds such as Texas and California, the growth continues, but where volleyball is the top sport by 15 to 20 percent, including in Nebraska, Iowa and Michigan, "we're starting to see a decline," DeBoer said. In basketball, I could post up and score. In volleyball, you have to be good at everything. You have to work together more. Part of that is due to budget cuts and merging school systems. The boom in what she calls "pay-to-play" youth volleyball makes it less and less likely that a girl with minimal experience will be able to play at her high school. "And that's what happened in basketball," she said. Later this year, Flynn plans to introduce a new version of basketball -- a seven-on-seven game with a focus on participation and development -- at the club level to entice more young girls. "Players quit when they don't play," he said. "We're going to change the game with this." Predicting how the numbers will evolve is among those murky areas that keep DeBoer awake at night. But volleyball club coaches aren't overly concerned, nor are the girls who continue to discover the sport's appeal. Redan High School (Georgia) freshman Takaira Flemons discovered the game at a summer camp at Georgia State. Her high school coach wanted her to try out; now she's working toward a volleyball scholarship. "Volleyball is a game of the mind," the 5-foot-11 Flemons said. "It takes strategy. It's not easy, but it's not hard. I don't like basketball. Basketball seems like the same thing every time. I don't like to stand under the goal. I don't like running at all. It's the same repetitive thing. In volleyball, it's something new, every set, every game." If you've been on Facebook this week, chances are you've seen someone share comments made by Geno Auriemma, coach of the University of Connecticut women's basketball team. UConn hasn't lost a game in more than two years and is in play for a fifth consecutive national title. Even after more than 30 years as head coach at UConn, Auriemma said that recruiting "enthusiastic kids is harder than it's ever been." In the video, he said that today's kids are so influenced by professional athletes who they see as "just being really cool" -- athletes they then try to imitate when they play. "They haven't even figured out which foot to use as a pivot foot, and they're going to act like they're really good players," Auriemma said. Forget about playing for the love of the game or to support teammates, he said; too many players are focused on themselves. "They're allowed to get away with just whatever, and they're always thinking about themselves," he said. "Me, me, me, me, me. 'I didn't score, so why should I be happy?' 'I'm not getting enough minutes; why should I be happy?' That's the world we live in today, unfortunately. Kids check the scoreboard sometimes because they're going to get yelled at by their parents if they don't score enough points. Don't get me started." Auriemma made the comments at a news conference during the NCAA women's Final Four in 2016, but Matt Lisle, a professional hitting coach, shared them on Facebook on Monday. The video has been viewed more than 35 million times on Facebook. Why did year-old comments strike such a chord? I put that question to some prominent voices in the sports world and to my Facebook community. The response was quick and universal: There is too much of a "me" culture in youth sports, too much involvement by parents, too many coaches concerned only with winning and too little focus on just playing the game. "What Coach Auriemma is addressing is accountability and responsibility for who you are and how you interact with others," said Donna Orender, former president of the WNBA. "We hear so much and see so much of the coddled generation these days and especially in youth sports, where there is a focus on the 'me' culture in the scramble to be seen and earn a scholarship." Orender -- founder of Generation W, an annual women's leadership conference in Jacksonville, Florida -- said Auriemma's comments get to the heart of what it takes to excel today: to work really hard and really embrace the power of being a teammate. "Life is not a highlight film," said Orender, who played college and professional basketball. John O'Sullivan is a former college and professional soccer player who started the Changing the Game Project. His organization aims to return youth sports to children and "put the 'play' back in 'play ball.' "
He said it makes him sad when he sees youth coaches allow the type of behavior described by Auriemma. "It is our responsibility as coaches to teach kids to be humble, to be hungry and to be a great teammates. It amazes me how many coaches ignore this responsibility because a player's talent might lead to a win." What then happens, O'Sullivan said, is that the player's talent takes them to a higher level where "character matters" -- but they lack the character needed to sustain themselves. "That's when it all falls apart, and it didn't start in college," said O'Sullivan, who has coached on every level from children to college. "It started with parents and coaches at age 12 looking the other way because a kid happened to be a good player. That is our outcome-driven youth sports system in a nutshell." Does sports participation deserve a trophy? Let the parental debate begin! Auriemma said that when he and his fellow coaches watch game films, they're checking what's going on on the bench. "If somebody's asleep over there, somebody doesn't care, somebody's not engaged in the game, they will never get in the game. Ever. And they know that. They know I'm not kidding," he said. Lisle, who shared Auriemma's comments, works with professional and college baseball players and is the founder of TheHittingVault.com. A former collegiate hitting coach, Lisle believes that the video resonated with so many people because it speaks to coaches, players and parents. "For parents, they want to hear that effort and attitude get rewarded at the highest levels, not just talent," he said. "For coaches, they have a coach of the highest authority giving them permission to do the same and to remind them that coaching isn't just about winning." A mother of two who didn't want me to use her name said Auriemma's comments reminded her of one of her daughter's coaches. Her two daughters aren't the greatest athletes, but they pour their hearts and souls into the game, she said. Last year, one of her daughters was pulled up from the junior varsity to the varsity team. "To be honest, I was surprised, as there were other players who were better, and I could hear those other parents complaining," the mother said. "The coach said to me that (my daughter) is what he is looking for in a player. She shows up for every practice on time. She is a team player on and off the field and will get the ball to the person in the best position to score versus going for the glory herself. And she is as excited, if not more so, when others score." Lisle said Auriemma's words should also motivate young athletes as they realize that some of the top coaches in sports are paying attention to their attitude, their effort and whether they are playing with passion and excitement, not just their talent. "In my 17 years of coaching, I come across a lot of younger kids who are 'too cool' to show emotion and passion on the field, and hopefully, this video inspires the athletes who have been holding it in to let it shine," he said. Lisle's post has been shared more 650,000 times, and more than 25,000 people have commented. Said one commenter, "Best place to teach them is when they are young! Teaching them to love the sport and have respect for the sport and each other as teammates should be a coach's number one priority." Plenty of people spoke about how parents are causing a lot of the problems in the game. "Parents living vicariously through their kids, pushing them too hard, too soon. Too many games, too much pressure and not enough fun," one commenter on Facebook said. "The best athletes of prior generations didn't specialize until high school or college. They didn't play the same sport year round for half of their lives because their parents thought they'd 'get left behind.' "
Larry Robin, a father of two in Westfield, New Jersey, said he watched the video on Facebook and immediately called his 9-year-old daughter to watch it with him. "I thought his comments were amazing. I think it's a great thing to teach your kids at an early age that attitude is everything and a good, willing-to-work, positive attitude means everything," said Robin, who is chief financial officer for an apparel company. Robin says he's seen the same power of attitude in the workplace. "While I can't 'bench' people at work, I can tell you that the people who move up in my world are almost always the people who are smart and have really good attitudes. Those are my all-stars as well!" A very well written article that is a good read for all young athletes out there today. Derek Thiessen was an Outside Hitter for the Trinity Western Spartans from 2009-2015. *This is a bit of a long one, so strap in. This past summer I watched the Men’s Canadian Volleyball Team compete at the Rio Olympics. It was the first time the team had qualified in 20 years. It was a momentous occasion for Canadian volleyball and everyone was excited. Over the two weeks of the Olympics, a particular emotion began to develop within me. As I sat there on the couch nearly every day, I couldn’t help but begin to notice a hint of jealousy creeping in. Any time an athlete’s information would flash across the screen, I couldn’t help but take note of their age. An 18-year-old swimmer. A 23-year-old gymnast. A 30-year-old rower. And most notably a 25-year-old volleyball player. In fact, the Canadian volleyball team was comprised mainly of guys that were either my age or very close. Some of these guys even played with me on my university team. A lot of them are also around my height, my size, and my physical strength. On paper, we are pretty much identical. Yet, there I was, sitting on my couch. And there they were, at the Olympics. When you think of the word “sports”, what comes to mind? Entertainment, money, teammates, fun, frustration, love, fear, balls? When I think of the word “sports” I find a sense of comfort. I think of teamwork, sweat, strength, glory, and an overwhelming sense of accomplishment. I have spent the vast majority of time on this planet immersed in the sports culture. Growing up I tested out and played every sport there was available. I lived for the competition. Winning was always the goal. If you’re a high-level athlete, there’s a good chance your early years looked something like this: Growing up you were always one of the fastest kid in your school. Every sport you tried, you would have some success and excel quicker than others. When you did eventually specialize in a sport, you were probably one the best in your local district. Plain and simple, you were an athlete. Always have been, and most likely, always will be. But as you got older and moved up within each sport you played, something troubling happened. The pool of players increased. And not only did it get bigger, but the competition got better. With every step up, the skill required just to be “average” became increasingly more difficult to achieve. Just being tall, fast, or “athletic” was no longer enough. This is a moment every athlete will face. Hell, it’s not just athletes— nearly everyone will come face to face with this crossroad. We come to point where we realize just going through the motions is no longer enough. For me, I wasn’t ready for that choice. I would rather thrive on my natural born traits. I would rather use my physicality and try to win with brute force. Unfortunately, in a sport like Volleyball, brute force is not always the answer. Long story short. This mentality got me further than one would expect. I was lucky enough to get recruited onto one of the best volleyball teams in the country. With that, came a vast number of upsides. We had a great coach, amazing team culture, and a collection of some of the best players in the country. The last of these was certainly a positive and had so much potential to allow me to succeed. Instead, I let it become my downfall. In my early years, I wasted my time as a bench player. As far as I was concerned, I simply needed to wait it out, and one day, when I was “old enough” I would be a starter. I didn’t think about trying to beat out anyone. I just worked as hard as I needed to, but never harder than was necessary. Well… soon enough, I got “older”. And low behold, I wasn’t ready. To sum it up nicely, my final year consisted of a lot of frustration, bitterness, and regret — I was fighting every week for my starting position and ended up splitting time with an arguably better 2nd-year player. Not much could be done at that point and some young buck was showing me first hand all the mistakes I had made in the past. He proved my preconceived notions wrong and capitalized on my complacency. I had failed, and to be honest, it took me a long time before I could fully understand why. But after some overdue reflection — I get it now. I see where I went wrong. If you’re still a young athlete, I don’t want you to follow in my footsteps. I want you to succeed. I want you to realize that you are capable of so much more than you think. The only thing holding you back is YOU. Regret is a powerful emotion, but the hardest part about regret is that we cannot feel it’s full weight until it arrives. My hope is that you can sense my regret, that you can realize the importance and urgency of what I am about to pass onto you. In the next part, I have laid out what I see as some of the most destructive reasons as to why I failed to reach my athletic goals. And more importantly, I have outlined some helpful ways you can correct your path to put you on a more focused journey. As I read back and review everything I’ve written so far, I’m starting to notice a somewhat troubling similarity. With all these hypothetical “what if’s” and “what could have been’s” that I’m tossing around, I’m beginning to sound a lot like Uncle Rico. The washed up athlete who can’t let go. It’s a risky label to give myself. Our culture has turned this line of thinking into somewhat of a running joke. We laugh at the desperation and pettiness that comes with such a mentality. We have labeled these people as “stuck in the past”; which, yes, to a certain extent they are. But for those of us who are looking to improve ourselves, there is a valuable lesson to be learned from people like myself and Uncle Rico: Don’t make our same mistakes or history is destined to repeat itself. I’ve always thought I was the goal setting type of person. I had big dreams of what my life could be like and had a good idea of where I wanted to end up. All through my athletic career, I thrived on being the “all-star” player. It was the main thing I cared about. I loved being one of the best and sought it out wherever I could. Luckily, being a star player was something that always came easily. Being tall, jumping high and hitting hard never took much work. With these simple traits, you can actually make it fairly far in volleyball. That is until you get onto a team full of players who are ALL tall, high jumpers, and hard hitters. Just like that, you’ve become the average. Being the star player is now going to take some extra work. What are you going to do in order to separate yourself from the competition? My goals were based on the idea of being the star on my team — which don’t get me wrong, it’s was an admirable goal. But how was I supposed to get there? It was no longer going to be easy like before. Where I went wrong is that I set a specific goal based on an end result, but didn’t focus on the path to get me there. More on that later. This one comes back to something I mentioned previously — I sought out validation through being one of the elite. Simply put, if I wasn’t playing well in games, it meant I wasn’t living up to the expectations. But whose expectations was I falling short of? Well, in my mind, I was failing my parents, my teammates, my coach, my friends, my girlfriend. With every mistake, it seemed as though I was not living up to the image they perceived of me. And to a certain extent, yes, I did sometimes let down other people. But the amount to which they cared about my failures is nothing in comparison to how harshly I judged myself. We are all our own worst critics. The sooner we recognize this, the faster we can learn to avoid the trap of applying pressure when there is no need. Too much pressure can cause anxiety, frustration, and poor performance. But on the flip side, a lack of pressure can be just as damaging. As humans, we enjoy comfort. It’s only natural to seek out routine and stick with the status quo. Making a change in our lives is difficult and it takes consistent effort. We enjoy doing things with a predictable outcome — it’s the same reason we choose to watch a movie we’ve seen before over a movie we have never heard of. By the time I got into my third year of university, I had chosen to settle. The guys above me were simply too good. There was no way I could beat them out, so why even bother? They will be graduating after this season, I might as well just buy my time and be a starter next season. I wish that was my mindset, but it wasn’t. As far as I was concerned, the guy ahead of me was impossible to beat out. He was the team captain and arguably one of the best players in the country. Even if I somehow managed to play better than him, I could never fill his shoes as a leader. It’s painful to look back on this mindset now, but I regret to inform you that it was these sort of invisible scripts that were my greatest downfall. I already created a story in my mind before it even happened. We all suffer from the ill-timed and seemingly unfair obstacles that cross our paths. To think that your problems are any more important than some else’s is simply selfish. Whether it was injuries or what I thought were poor coaching decisions, I let my own problems affect my growth. I saw my issues as more important and ultimately expected special treatment because of them. I let these kinds of thoughts take over. I let them dictate the way in which I choose to take action. Instead of accepting my injuries and pushing for a faster recovery, I used them as crutches to lean on when I wasn’t a starter. Instead of proving my coach wrong, I accepted my fate. Making excuses in some ways ties into my last mistake. But I would like to mention one thing on the matter. When we say “I don’t have time”, what we are really saying is “it’s not a priority”. So next time you are complaining about doing something, don’t say that you simply don’t have the time. Plain and simple, tell yourself that it just isn’t a priority. You will be amazed at how quickly your mentality will change. The things that truly matter will get done and time will be allocated for what needs to get done. This was a big one for me and it’s something I still struggle with today. When I say emotions, I am mainly referring to what I would simply label as the Three F’s: Fear, Frustration, and Focus. I’m typically regarded to as a fairly calm person. In pretty much all things I do, especially sports, I never lose my cool. I liken to myself as a well-tempered person, who is slow to anger. I would certainly show emotion on the court, but almost never in a negative or damaging way. However, when it comes to these three F’s, I am all over the map. In pressure moments, I would let fear get the best of me. In games, I would let my mind run wild on all the possible ways in which I could screw things up. I would constantly battle in my own head with negative ideas that all revolved around letting other people down. After the fact, I would get so frustrated with myself for my unnecessary fear that I would rather just avoid high-pressure situations. I never got comfortable with them. Ultimately, I never had the focus required to handle those situations. Instead of just thinking about the task in front of me, I would be thinking about 4 points ahead when I may, or may not, have to serve with the game on the line. Reason: Big goals and dreams are awesome. But to achieve those goals requires a lot of patience and steps in between. Instead focus on daily, weekly, monthly, and yearly goals that ultimately build towards the big goal. By setting smaller goals and achieving them, you will receive more frequent feedback on what you are doing right/wrong. In the end, the small nuances of training are given much more meaning. Making sure you do weights today may not seem all that important in the long term, but when you define your small goals, you realize that for today it’s the only thing that matters. Reason: Brute force and physicality were my two main ways of getting points. But in volleyball, that can only get you so far. I never spent the time working on my passing and eventually got pushed out of that role. I didn’t work on my blocking and found myself on the bench. It’s easy to show off our strengths. It’s hard to expose our weaknesses. They can be embarrassing to work on and difficult to change. But you know what’s more embarrassing — spending your final year of university losing your position to a younger player. Reason: This one may not apply to everyone. But if you found yourself nodding your head when I talked about the Three F’s, then read on. A common trait of many successful athletes, entrepreneurs, and performers is having some sort of meditation practice. Whether it’s breathing exercises, guided meditation, or some other way of achieving a mindful state — the ultimate goal is to achieve awareness. Why are you anxious? Why are you impatient? What is giving you joy right now? By taking the time to sit down, and clear our mind we gain clarity and perspective. It will allow us to be much more focused in times of stress and help to reduce anxiety. Just like any other muscle in our body, strengthening our brain takes time. But with a daily mindfulness practice, we can sharpen our minds and gain back some emotional control. Mindfulness is not about getting rid of all negative thoughts and emotions. It’s about giving us an understanding of what they are, why they exist and realizing they do not control you. Reason: I cannot even begin to express how much I have learned from reading. I used to only read for school, but then I started doing it purely out of self-interest. I was simply amazed at the sheer volume of useful information that would come about from the different books I’ve read. Some of it only useful for small talk, but much of it has been simply life changing. If you are too busy to read during the school year, that’s fine — but the summer is where I highly encourage you to soak in as much as you can. Reason: There’s a wonderful subreddit known as r/explainlikeimfive. It’s a wonderful place where you can ask questions about complicated topics and receive simplified answers that even a five-year-old could understand. The reason these people can give you such simple and concise responses is because they truly understand what they are talking about. This is the truest sign of an expert and the same thing applies to sports. At a lower level, it is easier to get away with not fully understanding strategies and tactics of a sport. But when we reach the highest levels, those who genuinely understand the inner workings of the game will be the ones to stand out. Therefore, coaching is the best step in improving your own skills. After spending some time trying to explain a skill to a young player, you will soon begin to see how well you actually understand it. And if you find yourself struggling to explain it, you probably don’t know it. So keep practicing. 6) Get some better friends. Seek out a mentor. Reason: It’s easy to feel good about yourself when you are hanging out with deadbeats. When everyone around you is settling and not seeking out improvement, it’s easy to sink into a comfortable state. We even begin to trick ourselves into thinking that our minimal effort is exceptional in comparison to others. But it’s only human nature. We constantly compare ourselves to those around us. So why not improve the people who surround us on a regular basis. Seek out the people who want more. The ones who aren’t content with their current state. Or find the ones who are already exceeding. After enough time spent around these people, you will begin to notice what makes them special. You start to take note of their daily practices and all the little things they are doing to improve themselves. If you don’t have the luxury of just finding new friends, seek out a mentor. Find someone who has been in your shoes and provides you with some wisdom. Bouncing your ideas off this person can be beneficial for both parties involved. All you need to do is ask. Well…that’s a tough question and ultimately it’s not one that I can answer for you. We are all going through life in our very own unique ways. There is no one true pathway. In fact, there are millions of paths we can encounter. Some will be freshly paved highways, some will be windy roads through the mountains full of switchbacks, some may even be a little bit bumpy, and then some will send you on what feels more like a suicide mission than an actual pathway. Yet, that’s just the way life goes. I cannot guarantee you safety along the way. But what I am offering is a previously used map. It’s one that is covered with poor choices and riddled with wrong turns. However, it’s also one that is packed full of treasure — with X’s that mark the spot. My goal with this whole article was to hand over this map and show you where to go. But ultimately, I cannot force you to use it. That choice is yours. Big win by Canada Men last night - 3-1 over Italy. It puts Canada in 2nd place in their pool, ahead of BRA, USA and FRA. They will play Russia who ended up in a 3 way tie for first place in Pool B but got ranked in 3rd with the tie breaking system. Match vs. France at 2:05 PM!